The news of a last-minute ultrasound had us rushing west to visit our birth mother. I was so excited! 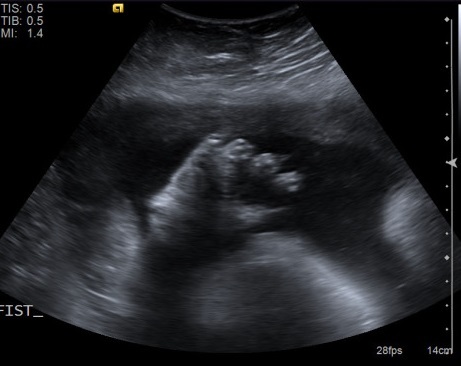 Excitement about an ultrasound may seem normal to you, but in my world, the infertile world, ultrasounds were usually the source of despair and bad news, not good news. I’ve had at least 100 ultrasounds, and I’m not exaggerating that number. You have ultrasounds with intrauterine insemination procedures to see how follicles are developing, you have ultrasounds to see if cysts are developing and if your cycle has to be canceled. You have ultrasounds three or four times per IVF cycle to see how you are responding to medicines. Those ultrasounds are tense as you wait with bated breath for “good” news. But it’s hard to quantify. Everyone responds so very differently and it’s hard to know if something is “good” news. And then there are the ultrasounds that are branded in my mind. 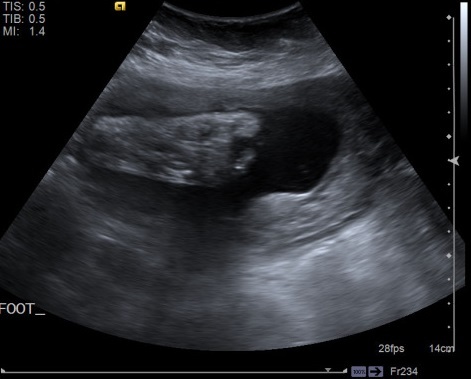 The ultrasounds when they tell you something is wrong, or you just know it is. When the doctor told us we were carrying mono/di twins and it would be a high-risk pregnancy, worry overcame the joy of finding out we were finally pregnant again. That ultrasound sent us scurrying to research TTTS (Twin-to-Twin Transfusion Syndrome). When they couldn’t find a heartbeat–any heartbeats–those two ultrasounds were branded in my mind. They do an ultrasound right before they do a D&C. It’s final confirmation that the pregnancy is over. That’s the ultrasound that quashes the unreasonable hope you’ve held dear. When they thought we were losing our miracle babies, that was one of the worst ultrasounds of my life. The ultrasound tech was unskilled and it took over an hour to find out just a few key pieces of information. I thought Tim was going to whip the wand out of her hand and do it himself. He did end up telling her how to measure the fluid and find the key items to confirm if the pregnancy was possibly still viable. Him being there kept me sane as I endured a very uncomfortable ultrasound on one of the worst days. Maybe it’s me. Maybe I’m simply less afraid. I know he’s in a body that is more equipped to carry him. And the pregnancy is going well. It’s so far along. Whatever it is, I could not have been more excited about this ultrasound. Getting us all in the room? Well, that was a bit like watching the Three Stooges. No one was available to watch the girls, so we had twin toddlers, the two of us, the birth mother and the ultrasound tech crammed into a space really meant for three people. We were juggling blankies, sippies, squiggly toddlers and a very pregnant birth mom. It was a ridiculous amount of work just to get us all situated in the room. And then we got to see him. Wiggling and moving. So gloriously wonderful! He was waving his hands and his lips were puckered up. It looked to us as if he was blowing us a kiss. I got to see him kick and move. He kicked so hard the birth mother’s stomach jumped! It was wonderful. There was a little sadness too, that I’m not the one who gets to feel him grow, but those feelings faded as I got to see him on the ultrasound. Perfect little fingers, perfect little toes, the spine, the face, the head. Everything was perfect. He will be perfect. He will be ours. I’m so glad that we were able to get this glimpse before he arrives. It helps make it even more real, it helps how close we are TO HAVING A BABY sink in. We’re having a baby in mere weeks! There is so much we have to do!!!!! Cue the panic. Lately, not a day goes by when I’m not asked, “How did you lose so much weight? What is your secret?” For those that know me, the weight roller coaster has had more ups and downs than usual over the last several years as we’ve dealt with infertility. I gained a lot of weight after our first miscarriage. I was so upset, it was the dead of winter and working out just wasn’t in the cards. Food was a source of comfort for my sorrow. And then we started treatments. This began a vicious cycle of “lose weight, it will make you fertile” and “you can’t work out, you’ll torque an ovary and/or lose the baby(ies).” I was on bedrest for every pregnancy and miscarriage. It’s hard to stay in shape, when your limited to laying on your side. Because of this, I’ve undoubtedly gained and lost hundreds of pounds during our infertility journey. In fact, I have four different wardrobes of clothes from those years that I’ve been slowly working my way back through. I still haven’t hit the smallest clothes. Anything is possible if your motivation is strong enough. I lost 40 pounds in three months before our first IVF cycle, because our clinic required it. I had a deadline and a goal, so I consulted with WebMD and created a plan of action. I ate no more than 1200 calories a day, as close to zero carbs as possible and did 2 hours of cardio a day religiously. It’s not a path for the faint of heart, but if the motivation is strong enough, it’s possible. I gained that weight back after my next miscarriage and had to work to lose it all over again before our final round of IVF. Three pregnancies in four years took their toll on us emotionally and me physically. The five months of bed rest didn’t help. I couldn’t walk around the block after the girls were born. My muscles were too weak; I had to relearn how to function in a vertical world. Stairs were brutal. Between the incision and loss of muscle tone, it was tough to do simple tasks like carry my girls around. Which brings me back to “Why?” My husband had agreed that, if I lost weight, we could “leave it in God’s hands”. We would simply see if we could achieve that miracle pregnancy on our own. The doctors had all recommended weight loss as a weight to mitigate some of the potential pregnancy complications, even though they still felt I’m at higher risk for additional miscarriages, pre-eclampsia and hemorrhages due to my complex medical history. When I looked at it this way, weight became the only barrier between me and another child. There wasn’t much I wasn’t willing to do to have another baby. If my weight was the obstacle to a healthy pregnancy and a healthy baby, and losing weight could possibly increase our odds of conceiving. I was on board. Tim also agreed to try IVF again if I hit my ideal weight. Honestly, I’m not sure he ever thought it would be possible. But as anyone who has struggled with weight will tell you, people who struggle with their weight are really, really, really good at dieting and exercise. They have willpower to spare–with the proper motivation. I had just found mine. My motivation doubled after I had surgery due to some complications after having the girls. My heart had issues during the procedure and they had to strap me to heart monitors for observation. Once they said, “We need to make sure you aren’t having a heart attack.”, I vowed then and there I would lose the weight to be around as long as possible for my girls. They are also the best motivation in the world to keep the weight off. The roller coaster ends here. I enjoy singing Head, Shoulders, Knees and Toes with my girls. The weight loss makes this easier and more enjoyable. I want to be able to play and chase them and I can do that so much better now. The good news is that overeating is tough when you’re lucky to get a few bites during a chaotic family dinner! And I wouldn’t change it for the world. How did I lose all of the weight, you ask? I found happiness. I found purpose. I found my motivation. I could drown you in numbers and studies on the science of losing weight, but the reality is, being happy and having the right motivation makes all of the difference. It’s funny, but now that we are adopting my original motivations for losing the weight are moot. But my motivation for keeping it off is now one child stronger. I want to be here, be healthy, and be able to enjoy and play with all of them, for the rest of a very long life. Visit our youcaring page and make a donation. Until March 1, each $20 donation will get you entered to win a 3 night stay at the Lake of the Ozarks in Osage Beach, Missouri. View here for more information. For those of you who have been reading my blog for a while, I’m sure that it’s apparent what my biggest fear is. I’m so afraid of losing another child. We’re not unusual–hell, in the infertility world, we’re not even a particularly sad story. I know women who have had four, or five, or even six miscarriages. I can only admire the strength it takes to try again when that much pain has gone before. Tim and I had discussed this at length and losing a fourth child was our limit. We would not have attempted another pregnancy in my body. Amazingly, my girls held in there, my body held out long enough and they are here with us today. And even though they both have ear infections, one is getting a set of molars in as we speak and my evenings and nights this week are filled with crying, fussiness and very little sleep, I wouldn’t miss a single solitary minute of it. When our birth mother made this statement, I could hear the conviction. She was addressing my biggest fear head-on. And I believe her. We both believe her. I’ve focused so much on my journey, our journey, in the blog, because her story is simply not mine to tell. But that doesn’t mean she hasn’t been on a journey of her own; that she hasn’t thought this adoption through. Sometimes, I think that maybe she is light years ahead of me in this process. She knew about this pregnancy long before we did and had those extra months as she contemplated her options and decided on adoption. We’re playing catch-up. We entered with far more exuberance and hope than knowledge when we dived into the adoption. And we’ve stumbled our ways ever since. I finally feel like we have the right team surrounding us to help us navigate the waters of this adoption. The new counselor is stepping in to help with the entrustment ceremony. She’s also offered to help us finalize a plan for contact between our families going forward. I welcome an experienced person to this process. I’m not sure how it all should work. This is where I believe a private adoption is definitely harder than an agency adoption. The middleman is lacking in a private adoption, and you either have to hire one or figure it out on your own. You have to ask the right questions in order to find the answers. And if you fail to ask, you may stumble into a quagmire. To me, an agency adoption appears to have this central lynch pin. For us, this help comes from so many directions. Our home study agency suggested the classes, and has provided direction on key steps in the process. This is really going above and beyond what we’ve contracted with them. The new counselor has done the same. In the end, whether we stumble inelegantly or move with the grace of a gazelle through this process, nothing else matters but the end result. Every minute of worry, every bit of effort we’ve put into this process will be worth it when we hold our son in our arms. How do we begin preparing our girls for the baby? They are still pretty young. We’ve been talking about them getting a brother, and have been pointing to the baby’s room, but I don’t think it is really registering. Now that we are drawing close to his delivery date, it’s time to really work with the girls so that they are welcoming when Baby H joins our family. We participate in Parents as Teachers, and our counselor’s recommendation was to make sure we have toys that are new to the girls when we bring the baby home. We will want something that is exciting for them, since the baby is so exciting for us. She also suggested putting together two small baskets of “quiet toys” that they get to play with only during the baby’s feedings. We kind of like that idea. And then we need to introduce them to the concept of a baby full-scale. We’ve played with them with baby dolls, but we’re making a trip to the library (and getting a book off Amazon) to help walk them through how to interact with a sibling. If we read this every night until he’s born, it may make the transition easier. We also have to think about what we should prepare as we have the girls transition from a daycare center to a nanny. I want to put together busy bags that have lots of different activities the nanny can easily rotate through. I need to start requesting books and activities from the library to give her the tools she will need. We need to think through how we have everything laid out in the house. Does the layout work well with three kiddos day in and day out, or would rearranging make everything more convenient? We also need to work on a rotation system for their toys so they they stay excited about playing with them and we’re not breaking the bank. This list keeps growing. But it’s a list I’m excited about. We’re also tackling the nursery. This is no small feat. As the picture above proves, we have our work cut out for us. We’re no strangers to home renovation. 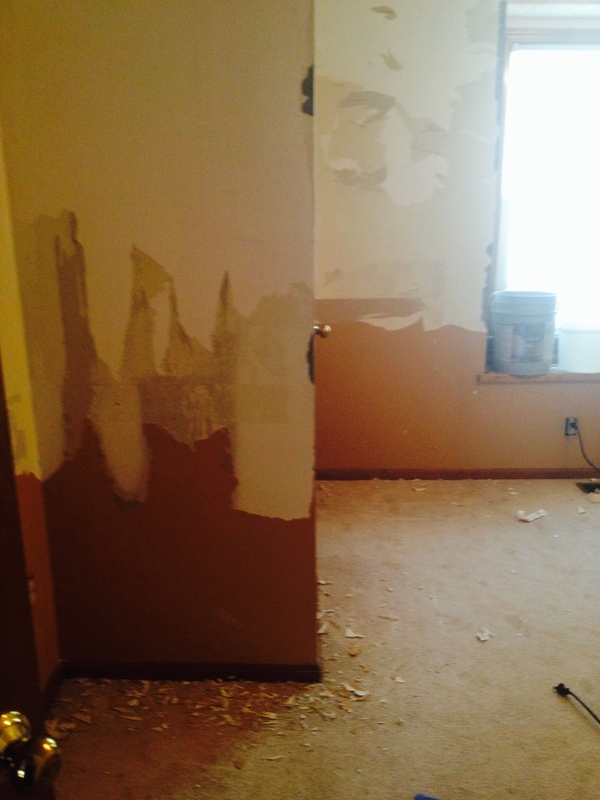 We bought a fixer-upper and during our infertile years used the renovations as a way to keep our minds off the pain and disappointment. We’ve installed a fence, repainted the entire exterior of our house (by ourselves) and tackled every single room. Every room but one, that is. The dreaded (former) fish room that had the most hideous fish wallpaper. We waited because we knew it was going to be the worst room in the house, but its day has finally come. Hopefully, soon, we’ll be able to say it’s Baby H’s room and no longer the fish room (although we’ll probably call it that for the next 30 years and visitors will always wonder why). All of these things are good problems to have. We are getting giddy as the journey nears its conclusion. We’ll juggle, we’ll find time to get it all done, and we’ll make sure our girls are as ready as a pair of 19-month-olds can be for a new baby brother.